since for him the spinal cord would suffice." Would you like to get paid every month to shop? Here’s how. Simply direct WAL*MART shoppers to our store. Now which side of the chart do you see yourself benefiting more from? The Internet is revolutionizing the way people shop! $100,000/month… to switch stores and buy similar products? We have people just like you earning these amounts every month. Learn the Real Truth about WAL*MART. Will you still shop there after you read this?. WAL*MART is destroying America! American jobs are being lost to China! WAL*MART reports that it purchased $18 billion of goods from China in 2004! WAL*MART highlights its American suppliers but imports 60 percent of its goods! WAL*MART is China’s 8th biggest trading partner – ahead of Russia and Canada! WAL*MART discriminates against women. In 2001, women managers on average earned $14,500 less than their male counterparts. Female hourly workers earned on average $1,100 less than male counterparts. WAL*MART violates Child Labor Laws. Wal-Mart agreed to pay $135,540 to settle child labor violation charges in January 2005 for allegedly breaking child labor laws in 24 incidents. WAL*MART shares little of its $11 billion profits with employees. To boost its profits by 1 percent, Wal-Mart is seeking to reduce its contributions to the profit sharing and 401(k) plans from 4 percent of wages to 3 percent of wages. So why do people shop there? Please contact the person you are reviewing this information with now and ask them to answer any questions you have. 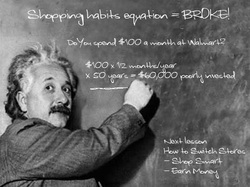 Would you consider shopping smarter today?